Do you remember the ice cream stick table lamps that we made in our middle school craft sessions or the cups made up of coconut shells or the foot-mats made up of coir ropes? We made those lamps and chandeliers and moved on. Scott Weaver, on the other hand, decided to stick to a toothpick art that he learnt in school at the age of eight. He made a small piece. Then he added another extension to it. Then another. 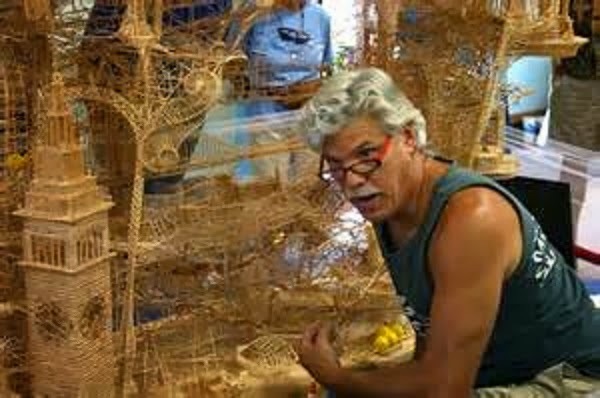 For 35 years he kept adding toothpicks to recreate the city of San Francisco and thus his own lifetime. His sculpture, a symbol of unyielding perseverance and unwavering dedication, makes the artist in me tumble in joy with the ping pong balls that travel across his structure unravelling his human life and superhuman spirit.